Each fall, about 250 million Monarch butterflies migrate from the United States and Canada to Mexico, where they spend their winter until conditions favor a return flight in the spring. 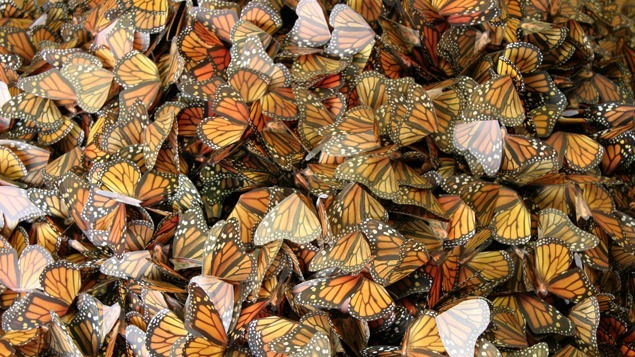 Inspired by this spectacular biological event, New York-based, and Mexican-born artist and self-taught lepidopterist Erika Harrsch has created a video and sound installation titled Eros-Thanatos, recorded at the Monarch Butterfly Sanctuary in Michoacan, Mexico. Thousands of printed paper butterflies will cover the floor of the gallery to provide visitors with an artificial experience of the natural phenomenon as well as a reminder of the fragility of life and the power of nature. To complement the installation, Harrsch will have pop-up performances of United States of North America. In an interactive installation, visitors fill out faux paperwork and spin a “wheel of fortune” to see if they can win a passport for “North America”—an imaginary country that combines features of Canada, the USA, and México. The passport combines features of all three countries, and at the center is an emblematic representation of the Monarch Butterfly, which belongs to the three nations—crossing freely without borders.